for today. Photo by Olaf Tausch, courtesy wikimedia. This morning Dr. Gerry Scott, director of the American Research Center in Egypt (ARCE), gave a telephone interview from Cairo itself. He gave what information he had on how the crisis in Egypt is affecting its antiquities. 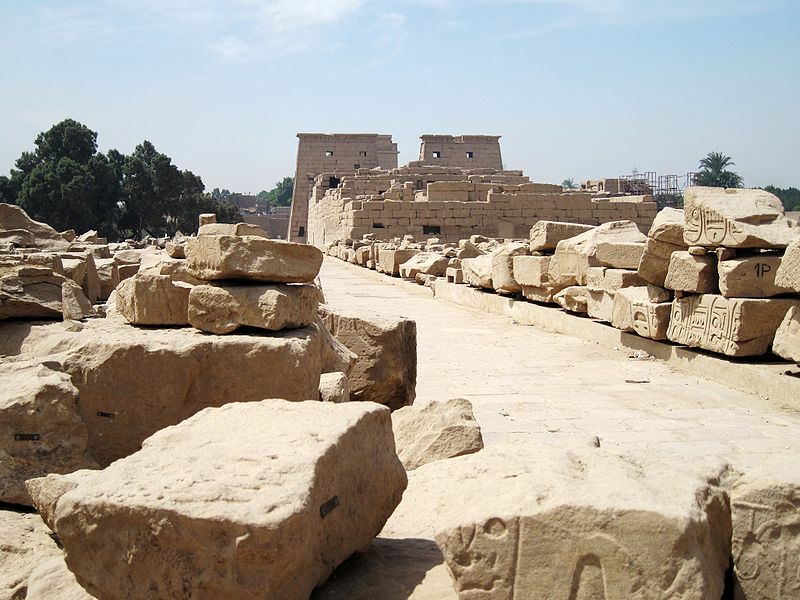 ARCE supports nearly two dozen active projects in Egypt. Its mission focuses on conserving Egypt’s cultural heritage and has attracted numerous grants – including funding from USAID. Dr. Scott said that for now ARCE intends to keeps its staff in the country. “At the moment, yes, we will stay and wait (and see) how things develop in terms of whether we can function or not,” he said. Scott has been stuck in his apartment over the Egyptian weekend (Friday and Saturday) and has had only limited communication through a landline. He started the interview by praising the protesters who held hands to protect the Egyptian Museum. The lack of communications, and the fact that the unrest has left him stuck in his apartment, has limited Dr. Scott’s ability to get a sense of how this crisis is affecting Egypt’s antiquities. The fact that it’s the weekend means that the Supreme Council of Antiquities staff, in Cairo, is off work. As far as he knows Zahi Hawass is still in charge of the council and he was not forced to resign even though he is a vice-minister. “What I have heard at this point is that it’s the cabinet that has resigned, I haven’t heard about people who are lower in office,” said Scott. Furthermore the council still appears to be operational, at least on some level. However he was quick to add that it’s still the weekend and we won’t know the full status of the council until the Egyptian work week begins tomorrow (Sunday). He also cautioned that this is a fluid situation and communication needs to be established with other ARCE projects. Please let us know about the status of Dr. Lehner and his teams at Giza since they are so close to the protests and there was word that the plateau was closed by the military. Are they safe? Are they staying or coming home? ARCE has been following the orders of the ruling regime for a very long time. The present crisis in Egypt follows from repressive rule, and organizations like ARCE have been complicit in the way they supinely accepted the dictates of the regime, in complete disregard of their responsibility to defend academic freedom. They should all be hanging their heads in shame at this time. I wish the Egyptian people the best in their effort to gain greater freedom and justice in their country. I'm very worried for all the scientists, both foreign and Egyptian, working in Egypt at thie time. I also worry about the countries future regime, whatever it may be. We can only hope the country doesn't fall into the control of hard line Muslims. Smashing the heads of mummies eerily reminds me of the destruction of antiquities in Afganistan, and on the Temple Mount in Jerusalem. Will the next news story be about the bombing of monuments like Abu-Simbel and the statues of the ancient Gods and Godesses? I believe Dr. Mark Lehner is planning to leave Egypt. ARCE Director, Gerry Scott is in Cairo and in touch with ARCE expedition leaders. So far all expedition teams are safe. Some are leaving now, others are waiting to see if their work can continue. Some expedition areas are quiet. Stuck on events, I hope these will lead the country to different new methods of administration, in democracy- For the moment,as an Italian conservator for Coptic Heritage Projects fund by Arce, knowing this places and people, I faith in the continuity for all the work in field expeditions are doing to do conservation and research. Greetings to all of you there, G. T.